Samuel Marquis is a bestselling, award-winning suspense author. His books include “The Slush Pile Brigade,” “Blind Thrust,” “The Coalition,” and “Bodyguard of Deception.” He works by day as a VP–Hydrogeologist with an environmental firm in Boulder, Colorado, and by night as a spinner of historical and modern suspense yarns. He holds a Master of Science degree in Geology, is a Registered Professional Geologist in eleven states, and is a recognized expert in groundwater contaminant hydrogeology, having served as a hydrogeologic expert witness in several class-action litigation cases. In this second thriller in the Joe Higheagle Environmental Sleuth Series, mysterious deaths are taking place in the Rocky Mountain region outside Denver, Colorado. Joe Higheagle–a full-blooded Cheyenne geologist who has recently become an overnight celebrity for bringing down a billionaire corporate polluter–is hired to investigate Dakota Ranch, where four boys have recently died from a rare form of brain cancer, and Silverado Knolls, a glitzy soon-to-be-built development. He quickly finds himself entangled in an environmental cancer cluster investigation as well as a murderous conspiracy in which friend and foe are indistinguishable and a series of seemingly impenetrable roadblocks are thrown in his path. 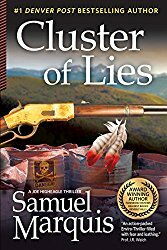 Cluster of Lies is a well plotted, fast paced, story of conscious versus greed. Marquis brings back Environmental Geologist Joseph Higheagle in what seems to be a simple case of reading reports and giving a high paying client his professional opinion, but if it were that simple, I wouldn’t be talking about it. Higheagle has to deal with some deep moments during the book that involve a lot of people. Keep quiet, go public, threaten, what should he do? The problems he faces involves a woman he’s falling for and her son that has developed cancer, most likely due to illegal dumping on the planned community they live in. Another problem is the man apparently responsible for it is the woman’s ex-lover. Marquis gives us a great supporting cast with the telling of five main stories all linked together through Higheagle and the illegal waste dumping. I liked Higheagles romantic interest and her son. It was a well used plot tool to discuss issues that one would want to know about while reading the book. The antagonist of the book is more complex and disturbed than you think at first. Marquis surprised me with this one. I read this one in about a day. It’s that fast paced and I think you’ll enjoy it. 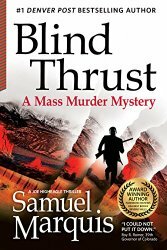 Blind Thrust by Samuel Marquis is a suspense/thriller set in Colorado that paints a picture of what could happen when greed overrides common sense. That’s a simple way of saying it. But then, I’m a simple speaking kind of guy. Environmental Geologist Joseph Higheagle has a problem, keep his mouth shut and keep a nice paying job, or go with his conscience and do what’s right for thousands of people. The choice might sound easy but when you factor in a billionaire bad guy, corrupt senators, evil security bad boys and a hired assassin sent to shut you up, you might think twice, at least. In this first Joseph Higheagle adventure Sam Marquis does a great job introducing the core of the main character, as well as his grandfather/father figure Chief John Higheagle, a retired lawyer who now lives with him and acts as his sounding board when the young Higheagle is faced with moral forks in the road. Combine that with some great supporting characters like the EPA agent Nina Curry, a romantic interest for HIgheagle, the younger one, not the old chief, and the USGS director Nickerson and you have a great story that’s well developed and fast paced. You might not think an environmental thriller would be very thrilling, but Marquis puts his years of experience as a geologist to work and it is very apparent in the technical speak that’s in the book. Sometimes that sort of becomes a bit heavy and repetitive but I see it as being legitimate to the conversations occurring. One thing I like about the antagonists in a Marquis novel is that they are not one dimensional. You almost see the humanity side of them and in Blind Thrust it’s very apparent. Charles Quantrill is a powerful man that ends up in a situation that he never saw coming, but that doesn’t make it any better nor does it make him any less guilty. I read this one in about two days. It’s that fast paced and I think you’ll enjoy it. #Interview with @SamMarquisBooks of Bodyguard of Deception. 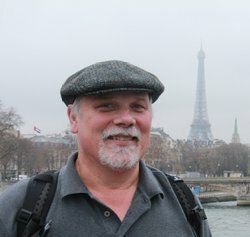 I recently had the pleasure of connecting with a great writer named Samuel Marquis, a #1 Bestselling Denver Post author, multi-award winning author, and hydrogeologist. Yes, you read that last one correctly. I think the strength of detail that last one brings to Sam’s personality is what makes his Historical Fiction so great to read. Okay, it’s ONE of the reasons. The other part is the fact he is just that good a writer. Ask James Patterson if you don’t want to believe me. Yes, THAT James Patterson. After reading and reviewing his book Bodyguard of Deception, I just had to ask some questions. I restrained my total historian geek self and didn’t send a book of probing his way. The following are what made it through and back. One of the things I always find interesting is where the inspiration for a book comes from. What sparked Bodyguard of Deception? 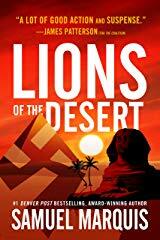 As a history aficionado who has always loved stories of the American West and World War Two, I have long wanted to write a novel that incorporated both of my research passions. That became possible when, several years ago, I read Ben Mcintyre’s Double Cross: The True Story of the D-Day Spies (2012) and Agent Zigzag: A True Story of Nazi Espionage, Love, and Betrayal (2007) along with Arnold Krammer’s eye-opening Nazi Prisoners of War in America (1996). Between these three well-crafted books, I learned about Double Cross and its cast of memorable British-controlled spies, while simultaneously discovering that, between 1943 and 1945, nearly a half million German prisoners were held in 511 POW camps across the United States, many of them in the American West. It wasn’t long after digesting these three great historical reads that I envisioned a WWII spy novel that would be uniquely set in both the European theatre and my home state of Colorado. What came to me in my overactive filmographer’s head was a kind of Das Boot (The Boat) meets Eye of the Needle meets The Great Escape with a hint of Arthur Penn’s classic The Chase as well as The Fugitive thrown in for good measure. But I wanted another important twist that deviated from most WWII books and movies: I wanted my lead German to be a sympathetic character even though he was fighting for Hitler’s Nazi Germany. I love to research. The amount of research you had to do for this book is staggering. You had to read at least 20x the amount of information just to write the least important real life character. I know you have a very intensive degree, one not related to World History at all, so what you’ve done amazes me, a historian. Do you have an affinity for research, and why history? I’ve always loved history, especially the underdogs and iconoclasts of American history, and I voraciously read books about military history and intelligence, specifically related to the Golden Age of Piracy, Plains Indian Wars, World War II, espionage, and the War on Terror WWII. But what started it all is I grew up watching classic World War Two movies and Westerns with my dad like The Great Escape, The Good, the Bad, and the Ugly, The Dirty Dozen, The Wild Bunch, Where Eagles Dare, and Patton. These movies had a profound impact on me and the stories I have come to tell. Because of this, it should come as no surprise that my books have been compared to The Great Escape, Public Enemies, The Day of the Jackal, and old-time Westerns. One reviewer said of my WWII thriller, Bodyguard of Deception: “Marquis throws in everything but the kitchen sink.” I consider that not a criticism, but a badge of honor and tribute to me and my late father and the movies we watched together growing up. 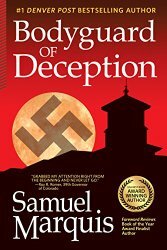 Bodyguard of Deception is currently a Top 10 Best World War II Spy Book and Top 10 Fiction Book Set During WWII on Goodreads along with such WWII thrillers as Follett’s Eye of the Needle and The Key to Rebecca, Daniel Silva’s The Unlikely Spy, and Ben Mcintyre’s Agent Zigzag and Double Cross. You’ve delved into an area of WWII history many Americans don’t even know existed. Some know about the Japanese-American internment camps, but some have no idea the US had German POWs here. Where did you get your research for that? I read Arnold Krammer’s eye-opening Nazi Prisoners of War in America (1996), and from there, I read around thirty books and articles dealing with German POWS in America. As stated in my response to Question #1 above, it is interesting that, between 1943 and 1945, nearly a half million German prisoners were held in 511 POW camps across the United States, many of them in the American West. POW internment camps like Camp Trinidad in Southern Colorado and Camp Papago Park in Phoenix, Arizona, were the scenes of exciting mass German escapes and FBI manhunts, forced POW labor to alleviate the drain of able-bodied workers fighting overseas, and internal battles and political murders between Nazi and anti-Nazi German prisoners. Which character are you most like or identify the most with in Bodyguard of Deception? Believe it or not, I like Katherine Templeton (the Countess von Walburg) the best. I like strong female characters. But because I am male, I am most like her son Erik, the German spy and escaped POW, and Colonel Morrison, the commandant of the fictional Camp Pershing. In my books, I make sure to care about, and even love, all of my characters, even the villains. You have to love your villains and show their good side, to make your readers uncomfortable and create dramatic tension. You do a great job with descriptive writing. I can feel the cold of the nights and the heat of the days, as well as see the fanatical moments of some of the characters. I can see the craziness in the eyes of one certain character toward the end. What type of background do you have in writing? What kind of training to give you that touch? A woman plays a big part in the book. Sometimes we men don’t pull off writing women well. We forget to put in the nuances that make her a woman and not just a female name attached to our male dialogue and narrative. Did you take a lot of care to get that just right? Did you have help with beta-readers, editors, or anyone to tell you that you nailed it? My wife is a professional book editor, and she is hard on me and makes sure I get my female characters right. The key is to have empathy for your characters and to constantly put yourself in their shoes. If you do that, I think the dialogue and character relationships will come out all right. What is your novel writing process? By this, I mean from idea to book shelf, do you research, write, put it away, then rinse and repeat. Every author has a different way. You just described it very well. My problem is that I have too many, not too few, book ideas and not enough time to turn them all into novels. I love the book cover for Bodyguard of Deception. It is not overdone but gets everything needed across. Once into the story you get the meaning of it even more. How involved were you in its design? Who came up with it? Who did it? My book cover designer is award-winning book designer George Foster (www.fostercovers.com), and I love what he does for my covers. He is a true professional and one of the best in the business. I give him a book synopsis, we talk about ideas for a half hour, and then I turn him loose and he does the rest. With your job by day, writing by night, what hobbies does such a busy man indulge in? What shows do you binge watch? What’s the last good book you read? Who would you like to see play your main characters in a movie or even a TV series? What was it like writing Hoover, considering all of the history we know about him? During the war, Hoover actually played a large role in hunting down German spies and POWs. As director of the FBI and as a human being, Hoover was absolutely over-the-top, so I had to write him like that. At his heart, he was an overzealous law-and-order type guy, glory-seeker, and turf-protector, who was driven by an almost religious-like fervor to promote the FBI in any way possible, at the expense of other law enforcement agencies. But he was also crucial to the modernization and technical optimization of law enforcement that we see today on all the CSI shows. Have you had any feedback from people that experienced the POWs in America? What is the project you are working on now? I am beginning to do my final month-long edits on the second book in my Joe Higheagle Environmental Sleuth Series, The Cluster, a childhood cancer cluster mystery set in Colorado. The novel is based on my hydrogeological experience with the Rosamond cancer cluster in California. Think Erin Brokovich, Michael Clayton, and A Civil Action. In other words, my day job as an expert witness in groundwater cases, but with more diabolically-clever corporate bad guys and dangerous gunplay. I’ve always wanted to write and simply have to do it. I like to create memorable characters and tell wildly implausible stories that actually seem quite real. You are on a deserted island and you can take only one book to read, what book would that be and why? Lonesome Dove by Larry McMurtry. Because it’s my favorite book of all time, the best story ever told about the American West, and it’s nice and long.